In the 1965 Major League Baseball season which was contested from April 12 to October 14, 1965, the Houston Colt .45s became the Astros, as they moved from Colt Stadium to the new Astrodome, becoming the first team to play their home games indoors, rather than outdoors. It was also the final season for the Braves in Milwaukee, before relocating to Atlanta for the 1966 season. The Los Angeles Angels officially changed their name to California Angels on September 2, 1965 with only 28 games left in the season in advance of their pending 1966 move to a new stadium in Anaheim. In the World Series, the Dodgers beat the Minnesota Twins in seven games. August 30 – Casey Stengel announces his retirement as manager of the New York Mets, ending a fifty-five-year career as player and manager. 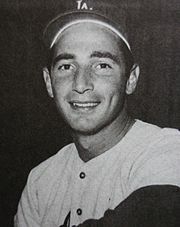 He is the only man to have played for or managed all four of New York's Major League clubs. October 2 – Sandy Koufax wins his 26th game as the Dodgers beat the Braves 3–1, for their 14th win in their last 15 games as they clinch the N.L. pennant. November 26 – Los Angeles Dodgers second baseman Jim Lefebvre, who hit .250 with 12 home runs and 69 RBI, is voted National League Rookie of the Year over Houston Astros second baseman Joe Morgan (.271, 14, 40) and San Francisco Giants pitcher Frank Linzy (9–3, 43 strikeouts, 1.43 ERA).